Lockforce Hull - Your Local Emergency 24 Hour Locksmiths Ricky - Locked Out, Entry Gained, Burglary, Lock Upgrades? Locked Out? Broken entry? Need a lock upgrade? Call Lockforce Locksmiths Hull's 24 Hour number today on 01482 298002. Welcome to Lockforce Locksmiths Hull. My name’s Ricky Burt and I’m your local locksmith technician in Hull and the surrounding East Yorkshire area. 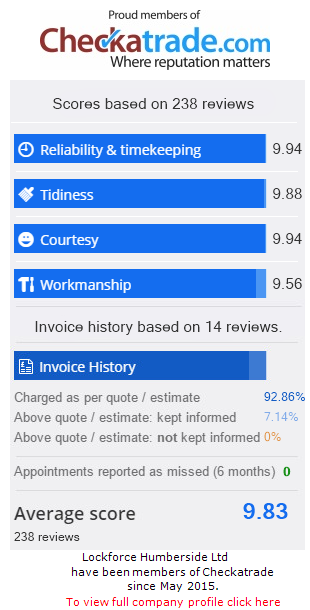 I am CheckaTrade accredited and reviewed. Available 24 hours a day to cater to your lock-out, lock repair and general home/business security needs. From my experience, the locks of my customers always seem to play up at the most inconvenient times for them…just before that all-important meeting or otherwise at 3am in the morning! I recognise therefore that the people of Hull need locksmiths who is available 24 hours a day to provide emergency lock solutions…and that’s exactly what I do!! When calling my 01482 298002 hotline, I promise you won’t be put through to a 9-5 call centre but rather will be able to speak directly to me. After hearing your lock problem, I’ll be able to put forward the solution that’s best for you before coming out and fixing in a jiffy! I’m only 45 minutes away from your emergency call out, so if you find yourself in lock bother, pick up the phone and call me today! My direct, 24 hour number is 01482 298002. Look forward to hearing from you! Call Ricky today you local Emergency Locksmiths in Hull on 01482 298002 for advice, request a rapid response callout or to see how we can best help you. Just a brief email to say thank you so much for coming on to our site at short notice and resolving our attempted burglary problem. Your service was excellent and we will definitely be using your company again should the need arise. We would recommend you unreservedly. When you’ve found yourself locked out of your property, I understand that your only concern is to get back in as soon as possible. However, what if you don’t live in Hull but need access to a speedy, competent locksmith? No problem, for as well as my local Hull area, I also cover the rest of East Yorkshire and can guarantee to be on the scene of your emergency lock-out in 45 minutes or less. Ricky at Lockfore locksmiths in Hull is on hand. So a high quality lock tradesmen who can respond to your lock-out distress call wherever you are in East Yorkshire, call me today on 01482 298002. If you've been locked out of your property and need to get back in quickly, Call You local 24 hour Locksmiths in Hull today on 01482 298002 and I will get to you as quickly as possible! Looking for a Locksmiths who is trusted by representatives across East Yorkshire. Then look no further me, your local first class locksmith Ricky Burt. I was born and bred in Hull and have lived in the principal hubs across the East Yorkshire area. Unlike some of the larger locksmith chains that will parachute somebody in to sort your lock query, when calling me at Locksmiths Hull, you can rest assured that you’re calling the services of a local locksmith who is in touch with their community and who cares very much about keeping it safe from burglary and break-in! As a former member of the armed forces, achieving security for people has always been my driving force. Armed with a wealth of experience from my time in the military, I now use my security skills to help residents of my local community to better prevent home invasion. In my opinion, the best action that homeowners can begin with to better protect their homes is to ensure they have high-quality locks fitted to their doors and windows. It's surprising how many people in Hull have loose fitting, inadequate or down-right poor locks on their property's entry points, making it very easy for both career criminals and opportunists to snap your locks and pilfer your valuables in a flash! At Lockforce Hull I only fit tried-and-tested, premium anti-snap locks as standard, so I can be confident that I am providing my customers with a sufficient level of lock protection! For more information about the locks I stock, click on the Security Locks link here. No matter what cut of key you send to me, My customers at Lockforce Locksmiths Hull are guaranteed the same professional service again and again. My investment in the latest mobile key cutting technology ensures that wherever you are in Hull and whatever key you have, I will be able to meet your needs…whether at home, in the garage or on the roadside. With competitive prices and an adept knowledge of key duplication, don't lose out! Call me today on 01482 298002. Call Ricky you local expert locksmith in Hull today on 01482 298002 if you require a new set of keys cut. Lockforce Locksmiths Hull have much experience in providing homes and business within the city and surrounding areas with reliable security alarm systems, proven to deter thieves and prevent burglaries wherever possible. Our preferred systems to implement into properties in Hull are high-security wireless alarm systems, fitted with telephone calling. This is system comes as standard with Passive Infra Red (PIR) detectors and Door Contact Sensors, tools and technology which monitor, reports and alerts the homeowners of any suspicious activity outside of the property. Additional detectors and sensors are available upon request. If you would like some further information as to how you can best protect your home, call Lockforce Locksmiths and Light Security Experts Hull on 01482 298002 and discuss our high-security alarm systems. Call Ricky for a fast response from a local locksmith in Hull today on 01482 298002 and I aim to be with you in 10 - 45 minutes. For more advice about how to best protect your property from lock snapping, call me today on 01482 298002. Call me today on 01482 298002 for advice, request a rapid response callout or to see how I can best help you. When hiring the expertise of a locksmith, customer concern naturally extends to the service they provide. However, how often do you think about the quality of the locks that are being fitted…? Well maybe you should ponder more…as not all locks are created equal. The Brisant range of locks are a favourite of mine and for good reason!. Unlike many of the bog-standard locks that a run-of-the-mill technician will put on your property, Brisant locks give my customers the peace of mind that their locks are acting on multiple levels to protect them from intruders. The lock's anti-snap feature is key; as most households with UPVC doors in the UK currently feature a lock device called a euro-cylinder. Previously holding credibility as a home protection device, advance in criminal knowledge has meant that they are now prone to burglar attack, with criminals learning how to snap the outer shell of the door lock before manipulating the remnant and breaking in without a sound. Frighteningly, all this can be done within as little as 13 seconds! In contrast, the anti-snap cylinder works by snapping at the sacrificial cut when a criminal attempts to tamper with it, shutting off the core of the lock which the lock-picker needs to access. Three trap pins also fire on each side of the lock, acting as a second line of defence, if it suspects it's being picked, bumped or tampered. The Brisant-BS is made to British Standard, look for the kite symbol as a mark of lock security excellence. Home owners of Hull, take heed! For having a decent lock fitted on your door won’t only minimise your risk of burglary…it may also save you a nasty fall-out with your insurers in the event of a break in! Indeed for the small print of many insurance policies will often state how a burglary claim will only be valid if locks that meet British Standard's of Security are fitted on the claimant’s property. While it makes sense that insurance providers are only prepared to pay out on a claim if measures have been taken by the homeowner to protect their property with proper locks, I often find that many people haven’t realised that their locks fail to meet the mark! Look out therefore for the kitemark sign present on all British Standard Locks. They’re fitted by me, Ricky Burt at Lockforce Locksmiths Hull, and will give you the peace of mind that a good quality lock is fitted on your property. The British standard kite mark is a UK product and service quality certification mark. This is issued by the British Standards Institution (BSI Group). The symbol shows that the product of matches that of which is required for the product to operate safely and efficiently doing the job that it is intended for. The British standard kite mark is a heart shaped symbol. See below with the date of test and also the standard it meets written below it. If you're unsure as to what locks you have fitted on your property and whether they're offering an adequate level of protection, give me a call today on 01482 298002 for Expert advice from a Local Locksmiths in Hull. Euro Cylinder identified by the shape of the lock. These are commonly fitted into MPL’s in both UPVC door and composite doors. But can also be found in some Mortice locks in wooded doors. These are now the most common house hold lock in the UK. Although these all appear the same from the front there are many standards. Standard Euro Cylinder, Anti snap locks, British Standards locks in 3 levels of security TS007 1 star, 2 star and 3 star. Currently a TS007 3 Star is the highest rating of Euro cylinder lock more information on these can be found below in the locks we use section... Euro Cylinders work by the pin being alinged into place by the correct key upon insertion then the cam the part in the middle of the lock will rotate allowing the lock to disengage the locking system in the MPL or mortice lock. There is also a oval cylinder the only difference is the shape is an oval surposed to the common euro cylinder shape. Mortice locks these are found in wooden door as from the outside the key hole is the best for of identification. There are two common types of mortice locks a sash lock and a dead lock the main difference being a sash lock retains the door then the lock is not engaged (The bolt is extended) and a handle is used to open the door. A dead lock use solely a bolt which is engaged when the key is turned. Mortice locks are required to be British standard by insurance company’s. This standard is normally BS3621 this can be identified by the British standard kite mark on the face plate (Where the bolt and sash come out of the door. Normally a brass or chrome plate) for more information see our locks and home insurance section. British standard mortice locks are normally 5 leavers when the key is inserted these align then a curtain within the lock is allowed to spin then the bolt is retracted. Night latch these are commonly missed call by the common brand a Yale lock. The lock from the exterior is identified commonly by the round lock face (rim cylinder). These locks are used for additional security and multiple occupancy households. These again are most common on wooden doors, they work by when the door is closed the latch catches in the keep attached to the frame. Meaning there is no need to physically turn a key to lock the door. Benefits to this type of lock are they can be open from the inside easily without a key (on non-British standard locks) allow easy exit if multiple people are inside the property. Down side are unless British standard you then need a British standard lock as well on the door for insurance purposes (unless interior doors have additional locks). Also if you shut the door and leave the keys inside you are locked out of your property. The principle of these locks to open is the same as the Euro cylinder where the key moves the pins into alignment but then instead of moving a cam in moves a Shaft the turn the night latch mechanism therefore opening the door. For a professional opinion on lock variants and unrivaled locksmith expertise- call your local Locksmith in Hull on 01482 298002 and speak with Ricky of Lockforce Locksmiths Hull regarding your domestic or commercial security. The services I offer are not limited to locks, I take great pride in providing a wide variety of home light security services ranging from sash-jammer implementation and the installation and configuration of security devices such as CCTV cameras. Lockforce Locksmiths in Hull also provide businesses in Hull a wide array of office security services to ensure your place of work is fully protected. For more information regarding how you can obtain affordable, top quality light security services in Hull, contact Lockforce Locksmiths Hull on 01482 298002. Are you considering increasing security on your property with the use of CCTV (Video Surveillance)? At Lockforce Locksmiths Hull, Ricky fits the highest level of CCTV to meet your needs. Moving home for the first time? Or even a veteran? Home owners must be aware when moving into a new home. Who has keys to the property? Make sure all doors and windows meet the regulations set by your insurance as these are strict guidelines they set to insure you are doing all you can to keep your property and your selves safe. These can be found in your insurance booklet or Terms and conditions. If you are unsure ring your insurance company and ask them to talk you through it. Here at Lockforce Locksmiths in Hull. I, Ricky Burt, can come and conduct a security survey on your property, or you can even call me for Free Advice. It’s important to make sure your new property is secure and safe upon moving in. If you are in need of a locksmith to fit your home with new locks whether this is for your doors or windows we can do this for you contact Ricky today for more information on these services. Together we can make the security and integrity of your own home be achieved and increased in no time at all. All our locks we fit are to that the insurance companies require, they also come with a 1 year warranty from Lockforce Locksmiths in Hull. For more Advice and guidance about security when moving home contact Ricky Burt at Lockforce Locksmiths in Hull today on 01482 298002. Making your new house a safe home. Not only do I have an extensive background in not only locksmith services for doors, but also for window lock repairs and window boarding. So, if you have any concerns about malfunctioning window locks, don’t hesitate to call me on 01482 298002. A broken window is never an appealing sight, unless of course you are a burglar looking for easy entry into a property. Whether you are a homeowner, shop owner or own a commercial property who has experienced your windows smash or window locks break, you can rest assured that help is only a short call away. Don’t leave a broken window untreated- instead, call me on 01482 298002 and speak with me regarding my expert window boarding service. Job: I was called to a home in Hull where a customer had been assaulted and had his car stolen whilst we were conducting delivery to the local people. Solution: This is one of the work crimes of burglary I have seen so far which left a man not only car less but unable to get into his home, I arrived 40 minutes after getting the call and picked open his mortise lock allowing him to be back in his home. I then set about changing his lock, so he was assured they could not enter his home with the keys they have stolen from him. We were called to a business in Hull whom could not lock their doors after they closed for the day. The company had steel doors with adams rite locks fitted with Euro Inserts. The Adams rite lock was failing to engage causing the doors hook to not engage, the adams rite lock and euro cylinder where changed all within an hour. The customer was so happy they could finally get home and know their business was safe again. We were called to a home in hull where the customer informed us that they could not lock their door at 0005 on 23rd July 2017. We attended the house wishing 20 minutes of receiving the call and could see the door wasn't correctly aligned. The alignment issue was sorted. The customer was so grateful they could now get some sleep after being let down by two other 'Local' locksmiths whom never turned up to the house. The customer also kindly left us a review on Checkatrade detailing her experience with Lockforce locksmiths in hull. If your door isn't locking correctly or is catching every time you close it. This means the alignment is out and needs correcting call us for free advice on how to do this or book an appointment to get this resolved so this problem doesn't happen to you at the most inconvenient time. Problem: I was called to a property in Hull post burglary. Upon arrival it could be seen that the lock had been snapped and entry had been forced though the front door. The door was a solid composite door which the customer thought (and indeed was told! ) that no one would get through. 1st Solution: Customer was taught about lock snapping and shown a demonstration on how this had happened. The customer was then shown all the options available to prevent this happening again and decided to have Ultion TS007 3* locks fitted. Later that week, the customer called again to inform me that someone had tried to gain entry nto their home. They had broken the handle and snapped the lock…however unlike the standard lock which she had previously, the pin within the TS007 locked the cam and entry though the door was halted. The customer was really happy their lock had worked as expected and that the burglary had been unsuccessful. 2nd Solution: For added security, I replaced the Ultion door lock and handle and fitted sash locks to the windows for added security. I attended a reported break-in to a property on Great Field in Hull. Upon arrival, I saw how one front window had been smashed. The toughened security glass that fortified the window was broken but thankfully had held in place. After gaining entry into the property (as the locks no longer worked), I found that the rear door had also been forced open. 1st Solution: The broken window was removed and the glass cleaned up. I then boarded up the window before fitting the rear door with new MPL and anti-snap locks. The front door also had an anti-snap lock fitted. Then later that week I was called back again, as the customer had suffered the misfortune of having the glass on the back door smashed. 2nd Solution: I removed the window and boarded it up. The landlord then asked for all the windows in the property to be boarded. For added protection, he also requested I fit an alarm and security light to warn of intruders. This was all done the same day. I routed the alarm so it would ring the mobile of the landlord if it was triggered, meaning the property owner would be informed right away if someone tried to gain entry into the building. I was called to a house which had been broken into overnight, where unfortunately the burglars had taken their spare keys and both of their cars! On approaching the property I found that they had snapped the door’s oval cylinder lock and gained entry through the door. As all the customers spare keys had been taken, all the locks needed to be replaced. Solution: I fitted ERA sash locks to the 2 external wooden doors and the OVAL Cylinder sash lock was changed for a Legg Sash lock. Both patio doors also had Brisant’s Ultions locks fitted too, making the chances of the locks being snapped again very slim. I was called following a break in on a commercial property. Upon attending it was clear entry had been forced using a Crow Bar. The break-in had been made easier as the property did not have British standard locks fitted. Solution: The frame was repaired and a British Standard dead lock was fitted. Also an additional British standard dead lock was fitted to the top of the door, making the door harder to break-in using a crow bar. I was called to a house in Hessle where 4 windows would not open. The handles would lift up but the window remain locked. Upon investigating the situation it was clear that only one side of the windows MPL was moving. Solution: The window was opened using specialist equipment and the gear box from the window was removed. I then operated the gear box and could see only one side of the gear box was sliding. This was the same for all 4 of the UPVC windows. Replacement gearboxes where ordered the same day and then delivered the following day. All the faulty gearboxes where replaced with the new gearboxes and the windows were tested. The windows were now functioning correctly and a 1 year warranty was issued. The customer was shown all of the fixed windows and tested there function which he was very happy with. He also mentioned a Patio door which was catching. I informed the customer that there was an alignment issue, which was not helped by the direct sunlight on the door. I then showed the customer how this is easily rectified using an Allen key. This problem was also corrected and the customer was happy with all the work completed which is shown in the review he left for Lockforce hull. Problem: Was called to a school in Hull where a security shutter on a window was locked shut and they needed this opening. The security window shutter was an automatic locking mechanism which is released turning a half Euro cylinder. Upon attending the school the Euro Cylinder was just spinning when the key was turned but the cam was not moving. Solution: The Euro Cylinder was drilled out and removed from the shutter. The shutter was proven to be fully functioning. Therefor a new Half Euro cylinder was fitted into the shutter and full functionality proven. The old euro cylinder had been proven to be faulty as the cam had detached from the cylinder. Problem:Was Call by HALL CONSTUCTION to one of their mail boxes which was locked shut and the key was missing. Solution:Mail box was opened using non-destructive picking. Then a new lock fitted with 2 keys supplied. I was called on a Friday evening to attend a repossession of a business in the Hull area. The old tenants had moved out but not handed the keys back so I was required to open the doors and change the locks. Upon attending the only entry point, there was a wooded door with a deadlock at the top and a sash lock in the middle. These were both bypassed, allowing the Warrant Officer to enter the property to carry out their work. Whilst this was being done, I changed the locks to British Standard Mortise Locks. Here at Lockforce locksmiths in Hull not only do we fit the highest security locks available. We also gain entry into these locks using the latest technics and training Ricky is trained to bypass even the highest security locks. This was put into test when Ricky was called to a customer whom was locked outside of her house. The property was fitted with TS007 3 Star ABS locks the lock was bypassed and the customer was back in there property within 10 minutes. There lock was then upgraded to the highest level of security available which is currently the SS312 Diamond approved standard. This lock was fitted to the customer’s house whilst the customer was back safety in their home. After a recent spike of crime around the Swanland area, Ricky was called to a customer’s house in the Swanland village to carry out a check on the current security of their home. As they also had a letter from there insurance telling them of their requirements. Upon inspection there was multiple doors on the ground floor. A composite door at the front of the property, two rear patio doors and a garage door. These doors had non BS standard Euro Cylinder locks fitted. The Customer was shown 3 Different levels of security Euro Cylinder that can be fitted to the property and the protection they provided. The customer had decided to have Ultion locks fitted to their home also they decided to have these locks as keyed alike suit, this made the customer be able to have one key that would work on all the doors to the property. In addition to this the window handles in the property that was not fitted with keyed locks where replaced with these as required by the customers insurance company. I was called to gain entry on to a garage by Humberside police. The Garage had high security padlocks on the reinforced steel door. This was an emergency call out from a local PC. I attended within 40 minutes. Then entry was gained within 20 minutes of arrival. The Police then undertook the work they required. Afterwards the Garage was secured using a padlock supplier from LockForce locksmiths in Hull. LockForce locksmiths in Hull where called to a home in Hull city centre on an evening upon attending the customer showed me that the key was just turning but the lock was not opening. The door was then opened by bypassing the lock using none destructive methods. After the door was opened the Yale Night latch was opened up and the fault was found to be the spindle inside the lock had come away from the back plate. This was then repaired and replaced the customer was also given a free security check where they were informed on the benefit to British Standard locks over None BS Night Latches. I was called to attend a flat where the tenant was locked out and had left the keys inside. This job was local to me in Hessle, meaning I was able to arrive at the in as little as 15 minutes after I was called. I was called to a job where a key had been snapped in an Iron Gate lock in Swanland. Luckily I was just passing that area and was able to attend 4 minutes after receiving the call. Upon attending, I realized the key had obviously snapped then the lock had been forced. So the old lock was removed using specialist tools as to not damage the Iron Gate. This lock was then replaced with a stronger lock and key (which is also an anti-snap lock) for greater protection for the home owner. After being called out at 2300 I arrived within 30 minutes to a nurse whom had just finished a 13 hour shift and her door wouldn’t unlock. The door was opened using non-destructive techniques within 20 minutes while the customer sat in the warmth of my van. Once the door was opened the customer was back in her house where she could finally have her tea after a long day at work. Whilst she was enjoying being back in her home I was busy repairing the faulty UPVC door. The Euro Cylinder was replaced with a TS007 UItion cylinder which provides the ultimate protection as well as coming with a £1000 guarantee. The lock come with 3 keys and information on the security it provides. As a locksmith my-self I have these type of locks on my own property. The customer was also given our NHS discount of 10% off of her bill. Customers Locked in their homes. Lockforce locksmiths in hull came to let them out so they could get back to normal life. Today I have been too two homes where people were locked inside their homes in hull. Both of these were gear box failures. This is usually obvious when the door handle in limp or will spin right round. Sometime the key will just keep turning in the lock. To prevent this you should not use excess force when locking the door. If the door becomes hard to lock it might be worth checking the door is aligned properly lockforce locksmiths in Hull do offer this service at a cheap rate and could save you being locked in your home and more money. This service is very cheap and simple to do it will also prolong the life of your door and its locks. Sometimes the door may need to be toe and heeled and this will just allow a bit more movement when adjusting the door. Other problems are Shoot bolt or hook holes becoming blocked with dirt or not being fitted correctly. Both of the customers door where opened no using non-destructive techniques and the gear boxed replaced with a free lock just to make sure the door will operate smoothly and lock and unlock very easy should it be needed. We were called to a job in hull on Wednesday 18th April 2017 to a door which a customer could not unlock their door. Upon attending the house the lock appeared to of been tampered with and a glue-like substance inside the lock. The door was opened using a technique that removes the lock without damaging the PVCu door. The lock was then replaced with a higher security lock and the customer was informed it might be worth informing the police as this is vandalism and can be dangerous in the event of an emergency. We was called to a customer whose house keys where stolen whilst she was out at a local sea side. Upon attending we checked the customers ID and gained entry into the house all within 30 minutes of the call. Due to the keys being stolen the customer asked if we could also change her locks on the front door. We showed the customer the types of locks available and left her to make a choice with her husband. They opted for the Ultion TS007 3* diamond standard Ultion lock as their main door lock this lock was then fitted and supplied with 3 keys and Ann additional 2 keys where ordered for next day delivery. The customer was so happy that she could feel safe again in her home and that the protection offered by the new lock was a lot more substantial than the old non kite marked euro cylinder lock. As a local Locksmith the locks we offer are only advised we will then leave you to make the choice of what locks you would like fitting these locks on wooden doors are always British standard as required by insurance and a minimum of anti-snap locks on uPVC doors. Locked out? Do you need an expert 24 hour, 7 days a week locksmiths in Hull and it's surrounding areas? Contact Ricky Burt at Lockforce Locksmiths. Expert Domestic and Commercial Locksmiths In Hull. See our friends at Pestforce Hull for your pest control in Hull needs.